“Hi dad, it’s your son, Moses Martin. 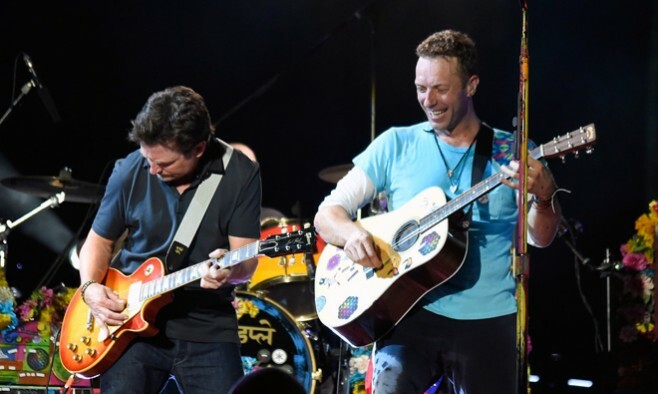 I was just wondering if you could play a song from both of our favourite film, Back to the Future,” said Chris Martin’s son over a recorded video at a Coldplay gig in New Jersey on Monday. Dreams really can come true. Well, at least, if you’re the son of the lead singer of Coldplay. And, though he may be known as an inspirational hero for people with Parkinson’s, Michael J Fox turned his attentions to being a guitar hero for a night. In a video on YouTube taken during the gig, Coldplay’s frontman declares the 1985 hit film, ‘Back to the Future’, as his and his son’s “favourite movie of all time”, before going on to sing ‘Earth Angel’, the Penguins’ track which sees characters George McFly and Lorraine Baines finally get together. The next moment, Martin is introducing Fox, who comes on stage with a Les Paul guitar in hand, and the pair start playing in harmony before launching into Chuck Berry’s ‘Johnny B Goode’ – taken from a celebrated scene in the movie. During the high-energy performance, Fox displays little sign of his symptoms, instead showing off some rather impressive guitar riffs. The MAN’S still got it….you rock, MJ! !